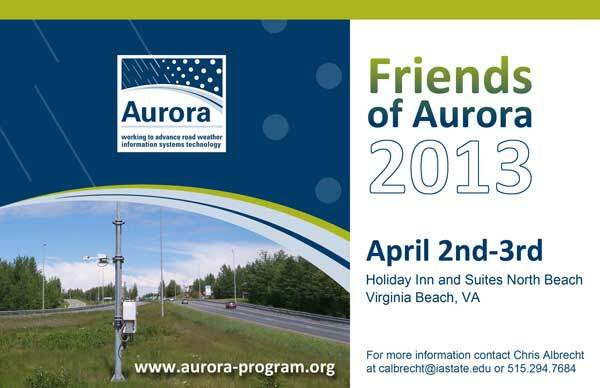 Aurora hosted the sixth Friends of Aurora event on April 2-3 in Virginia Beach. This event was held in conjunction with its board meeting. 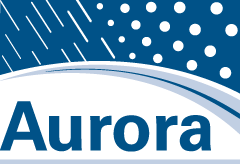 Friends of Aurora was established as an outreach initiative with private sector RWIS service entities intended to improve dialogue between the public and private road weather communities. The event included an evening reception that provided attendees the opportunity to meet and discuss a variety of industry issues before a half day of formal presentations by both the vendors and Aurora board. The Aurora board presented information to vendors and guests regarding completed and ongoing research projects and priorities. Vendors, in turn, had the chance to present to the Aurora board about their current and future products and priorities. Attendees included current Aurora members and guests from the private sector, including representatives from RWIS equipment and forecasting vendors. The objectives of this project were the utilization of RWIS data within the PPAES and the blending of PPAES products produced using different observation platforms.Wintertime precipitation has profound impacts on surface transportation. Surface transportation ramifications include decreased public safety, compromised traveler mobility, diminished productivity of roadway users, and adverse environmental effects due to the need to chemically treat icy roads. The winter road maintenance community can benefit from having more information about wintertime precipitation, including where precipitation is occurring and precipitation rate, leading to improvements of safety and greater cost effectiveness. Determining wintertime precipitation occurrence and intensity is challenging. The Pavement Precipitation Accumulation Estimation System (PPAES) was designed such that precipitation field analyses could be produced using individual sources of information and multiple sources of information. When multiple sources are utilized, PPAES algorithms are designed to take advantage of data strengths and mitigate data weaknesses to maximize analysis quality. This study, in addition to providing new techniques for fusing information from multiple sources to produce enhanced wintertime precipitation analyses, identifies future research areas that may lead to even more advanced techniques that will serve the road weather community. The objective of this project was to create a do-it-yourself guide for RWIS sensors, servers, databases, web displays, etc. 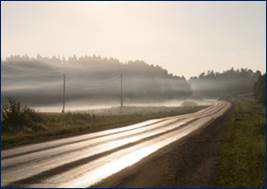 Results were incorporated into the Knowledge Base for Road Weather and Winter Operations. The purpose of this effort was to provide the winter maintenance community with an easy-to-use list of testing facilities that may be of assistance for winter maintenance-related research. Over time, the idea of a single facility or program developed into the idea of an information source which can help requestors of research find appropriate facilities and information. Information of appropriate testing facilities was incorporated into the “Winter Knowledge Base” project to meet the need for finding road maintenance research. Aurora is once again co-sponsoring the National Winter Maintenance Peer Exchange to be held on September 10-11 in Vancouver, Washington. Like earlier events in Ohio (2007), Wisconsin (2009), and Montana (2011), this exchange will bring together state DOT snow and ice control experts and private-sector providers of services, equipment, and materials to share information, network about snow and ice control issues, and discuss road weather issues. The Peer Exchange will address all aspects, both current and anticipated future needs, of winter maintenance, Road Weather Information Systems (RWIS), Maintenance Decision Support Systems (MDSS), Value Added Meteorological Services (VAMS), equipment (trucks, spreaders, AVL, etc. ), chemicals, chemical management, chemical blending, anti-icing, deicing, environmental stewardship considerations, training, personnel, etc.). This is the fourth Winter Maintenance Peer Exchange. Other participants in this event include Clear Roads, the FHWA, the AASHTO Snow aand Ice Pooled Fund Cooperative Program (SICOP), and the Pacific Northwest Snow Fighters. By participating in the discussions, these research organizations will better understand the gaps in knowledge, technology, and communication and work together to develop strategies to bridge those gaps. Openings are available for representatives of companies offering winter maintenance support services, materials, and equipment to attend and participate in the 2013 National Winter Maintenance Peer Exchange. For more information on this event, contact Lee Smithson, 515-239-1519, leland.smithson@dot.iowa.gov.